Carshalton Dad and garden guru, Richard Steeples, quit his City job after his first baby was born. His dream was to pursue his passion for gardens and spend more time with his young son and new baby daughter. Working long hours in the City, there must be many local dads who yearn to spend more time in Carshalton with their children. Even more must dream of quitting their jobs and pursuing a hobby they could turn into a business. Richard Steeples is one of the lucky few who have done both these things. In November 2010 Richard left his job in pensions to make a career out of his love of gardening. 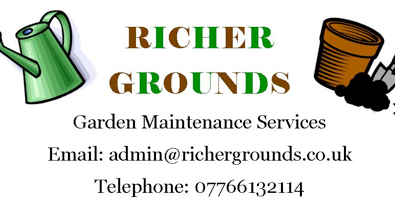 He set up his company Richer Grounds to offer garden maintenance services to the local area. He is also trying to look after his son Daniel, 2, and baby Rebecca now his wife Cath has returned to work full-time. Richer Grounds’ services include grass-cutting, weeding, clearances, planting and hedge-trimming. �“No garden is too big or too small,” says Richard and he welcomes regular and one-off jobs. Read Carshalton Mums’ reviews of Richer Grounds.